La Cote d’Azur and Provence is laden with historical architecture so travelers with a penchant for the past, and in particular for viewing Roman ruins, should consider a visit to Frejus, located a short 35 km from Cannes. While the center of town is busy and compact with pedestrian streets and shops, several well preserved Roman ruins are situated near the city center. 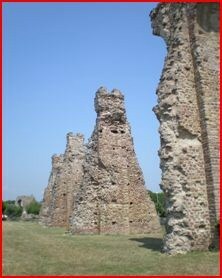 Frejus was founded in the first century BC and was an important stop on the Aurelian Way. 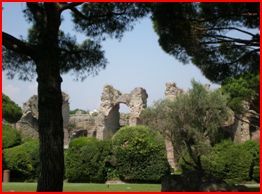 In 30 BC, the area became a retirement center for veterans of the 8th Legion. At about the same time Octavian brought ships captured at Actium to the area and began building the port that was to become the second largest Roman port after Ostia.There are several must see ruins including The Aqueduct with its massive pillars, which can be viewed along the Avenue du Quinzieme Corps and the N7, between the Avenue des Aqueducs and the D437 roundabout. Next, there are ruins of the Roman theatre located at the Rue du Theatre Romain, which are easily viewed from behind a locked gate. However, the highlight of a visit to Frejus is the Amphitheater, located at the west side of the town on Rue Henri Vadon. The oval arena seated 12,000 people and is only a bit smaller than the amphitheaters at Nimes and Arles. As you walk along the arched walkway, you can see the ambitious plans for its full restoration. Contact Northrop and Johnson Yacht Charters for More Information!